Success, I arrived in Panama. goal accomplished. This is the look of a woman who just got home after completing a 15,000 mile/24,140 kilometer ride from the Boston area to Panama City, Panama and back during the summer of 2012. I got home and all I could do was ask my son to help me put the bike on the center stand and take a picture of my face glowing with accomplishment. My son or daughter always greet me when I arrive after a long ride. I am always exhausted but very happy to be home to plan the next ride. During the summer of 2012, I rode my Triumph Bonneville from Boston Massachusetts, USA to the Panama Canal and back home. Total miles, 15,000/24,140kilometers. I traveled 9 countries, 23 American states used 5 tires, 2 chains, 4 sprockets, 3 oil changes, 1 major tuneup, 1 BIG bill in 60 days. All because I had a desire to challenge myself physically and mentally. 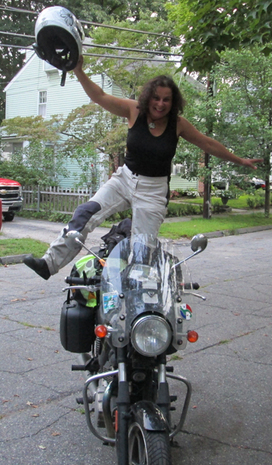 My goal is to ride my Triumph Bonneville to cover as much of the North American continent. I still have to ride my bike to Alaska before I can accomplish the North America riding goal. For now, I will feel a big accomplishment to have completed one of the most dangerous parts of my journey with most of it riding alone. This page is dedicated to sharing the ups/downs of the ride. of taking care of myself and my motorcycle. Possessing the tools and know-how is important, whatever the country traveled in. Riding to Central America provided a deeper understanding of the dynamics of group riding, whether with men or women, are so different from riding solo! The ride allowed personal growth overcoming fears of riding through very tight mountain roads, some at night with no illumination or guard rails. This ride offered so many experiences but it still has not quenched the thirst for extreme riding. I created the above butterfly because it represents the delicate nature of my rides. Butterflies are very gentle and roam briefly in our beautiful world, just like we do. When I went to Panama, I wanted to visit a place where butterflies roam freely. There is a beautiful place but it takes time to get there. Because the ride did not go as well as I wanted it to, I never had a chance to see my butterflies. The thirst for my butterflies continue, it is a dream that someday I will be able to visit a butterfly farm to allow them to fly next to me and I could touch them gently. During my ride from Central America, it was very sad when our windshields hurt them. I cried every time I saw one on my motorcycle windshield.